Organisers of the four-day gathering, that began on Thursday and attracted about 7,000 people, were baffled when the security chief of the convention centre relayed the police order to remove the banner. The organisers said that no one from the police met with them personally. “The reason given was, ‘It was too close to the road’,” said Pastor Greman Ujang, chairman of the the Gempuru Besai Raban Kristian Jaku Iban Malaysia. He added that the security chief told him the instruction “came from the Commissioner of Police (CP)”. Ujang said even though the instruction came from the CP, there should have been a written request or a police officer to explain the instruction. He said, since they did not want “to make a fuss out of it and be confrontational which could mar the gathering that had gone so smoothly,” they complied and placed the banner nearer to the entrance of the convention centre. “We did not want trouble, but we also want to act within our rights,” said one of the organising pastors who did not want to be named. In 2011 just before the Sarawak state election, Putrajaya drew up the solution which allowed the printing, importation and distribution of the Al-Kitab, the Bahasa Malaysia version of the Bible, containing the word ‘Allah’. The 10-point solution was to end a Home Ministry blockade of shipment of the Al-Kitab and other Christian publications which had the word ‘Allah’. The pastor said whether the order came from the police or not, “somebody is unhappy with the word Allah” on the banner. Participants of the gathering, which ended this morning with a mass Sunday service, yesterday made a stand to press for religious freedom that was promised to them when Malaysia was formed 50 years ago. Ujang, in a statement, stated that when the idea of a federation of Malaysia was proposed in 1961, their forefathers initially expressed grave reservations on various issues relating to the well-being of their people under Malaysian rule, including freedom of religion. He said since the safeguards to continue practising their faith and religion are under threat, they were entrusted with the responsibility to ensure that these agreements and rights were protected and honoured. Christianity came to Sarawak in 1847 with the arrival of Anglican missionaries who carried with them Bahasa Indonesia Bibles. The Ibans, Sarawak’s largest ethnic group, make up 52.6% of Christians in the state. 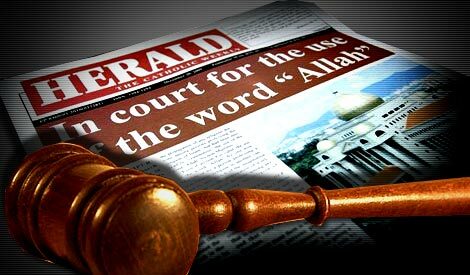 Malaysia’s Christian community recently made headlines when the Court of Appeal ruled last October to uphold the Home Ministry’s decision to ban the use of the word ‘Allah’ in the Catholic Church weekly Herald. The court said the word ‘Allah’ was not integral to the practice of the Christian faith, overturning an earlier High Court decision that the ban was unconstitutional. The ruling, however, led to churches in Sabah and Sarawak being more vocal in pressing for their right to use the word ‘Allah’, as they represent the majority of the country’s Malay-speaking Christians. The Catholic Church has since taken up their case to the Federal Court, with the hearing of the leave application to appeal fixed on February 24 next year. Correction …. fades quickly to fruitless sentimental commiseration. We cannot suffer with the oppressed when we are unwilling to confront those persons and systems that cause oppression.We cannot set the captives free when we do not want to confront those who carry the keys. We cannot profess our solidarity with those who oppressed when we are unwilling to confront the oppressor. Compassion without confrontation fades quickly ti fruit sentimental commiseration. To Apai Semalau. You are damn right about our leaders!. We have seen before a certain Iban senior politician put one hand in his crotch and the other shaking hand with his political master at same time bowing down. What a disgusting scene! How are we dayaks able to stand above our heads if we have such lowly mental attitude. Our panglima ancestors would curse and swear to see such a degrading personality. I am in total agreement with sister Irene Kana. Unknowningly, BN government has been tested. Hurrah ! to the organizers of this Natives Christian gathering. Now we have found that this government is really intolerance, biased,oppressive and suppressive in its governance. This time we need to gather the intellect mind of our natives brethren to organize more intelligent discourses and forums to enlighten our brothers and sisters on the Christianity’s stand in Sarawak. The directive to remove a banner for Iban Christian gathering with the word “Allah “was a gross abuse by the police or Home Ministry. The Christian community should protest in the strongest term the mafia style directive of the police for demandind that the organiser of the Event for Christians in Sarawak took down the banner. We shall fight back with greater resolve through the ballot boxes and public forum. The last we had our change, didnt all the seats in the Iban majority eent to BN? We dayaks are cursed with short memories and overwhelmed by promise of short term benefits by big time lying politicians every election years. When will we ever learn? 50 years on, and we are still divided without a “leader” who cares…….just blatant get rich politicians and ball polishers with their tails between their legs whenever the colonial “Boss” barks! Do you equate Dayaks with Malays – Melayu mudah Lupa as coined by Dr. Mahathir? Relocating, not removing the banner as ordered by the authorities was aright move. Shouting and fist fights could have ensued but the occasion was not right. According to official reports, the banner was relocated and not removed. Maybe the official version is right ,….. There you go. You know your place now. You who supported BN. Sarawak is known to be a harmonies state to live in but it the people with extreme ideas who damaged it. Nature of this misunderstanding would not have existed in this harmonies Sarawak as long as one’s person private moral does not interfere with someone’s. WE NEED TO LIVE AND LET LIVE. It gives me the impression that there are 2 allahs. If there is only one allah then one of them thus is the devil in disguise and using his henchmen to do the dirty job of making it exclusive. NATO. Comes election time vote BN again. We need to remove this evil, rotten, corrupt, hypocritical, oppressive and suppressive government fast or we will suffer. Everyone in his or her right mind must act fast! Keep voting the BN and soon churches will be dismantled like Indian temples. Don’t have to worry, by then smart malays & those corrupted millionaires/billionaires should have lari kuat kuat to other countries liow, life will be different & starting all over again.